"Greenbook" Committee of Public Works Standards, Inc. Welcome to the "Greenbook" Committee of Public Works Standards, Inc.
Popularly known as the "Greenbook," it was originally published in 1967. The 2018 Edition is the Eighteenth Edition, which is updated and republished every three years. These plans were prepared to answer a need for uniform design governing public works construction performed for cities, counties and public agencies. 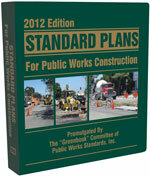 Public Works Standards, Inc. has issued a 2019 Errata for the 2018 Edition of Standard Specifications for Public Works Construction (the “Greenbook”). This Errata contains corrections and modifications that the Committee felt were significant. To download a pdf of this Errata, please click here. The members of PWSI are the American Public Works Association (APWA), Associated General Contractors of California (AGCC), Engineering Contractors Association (ECA), Southern California Contractors Association (SCCA), BNI Publications, and others as may be added by the members. The Board of Directors of PWSI is composed of five members representing APWA, and four other members, one each representing each other member of the corporation. The Greenbook Committee is an Administrative Committee of PWSI responsible for producing a new edition every three years and a supplement in each intervening year, promoting the publication, as well as evaluating additions, deletions and revisions. This same committee also does the same for the Standard Plans for Public Works Construction and the Special Provisions Guide. 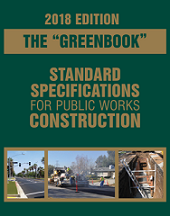 The Greenbook Committee is composed of at least 25 members and 25 alternates appointed by Public Works Standards, Inc. Seventeen members and 17 alternates from designated public agencies and utilities are nominated by the APWA. Six members and six alternates are nominated by the AGCC, and one member and one alternate are each nominated by the ECA and the SCCA. The Greenbook Committee may also nominate additional members. The Operating Policies and Procedures of the Greenbook Committee provide that members nominated by the Greenbook Committee be either representatives of public agencies, public utilities, contractor associations, or firms that serve as consultants to public agencies, public utilities or public works contractors on matters pertaining to public works construction. Also, that they have demonstrated their participation in the proceedings of the Greenbook Committee by their attendance at 5 Greenbook Committee meetings in each of the prior two years as evidenced in the monthly meeting minutes for those prior two years. The Greenbook Committee structure includes the following standing subcommittees, Specifications, New Materials-Underground, New Materials-Surface, Standard Plans, Special Provisions Guide, and Editorial Standards. Each subcommittee meets monthly and discusses and makes recommendations to the full committee concerning changes submitted as well as other issues related to their focus. Specifications focuses on Part 1. New Materials-Underground focuses on underground materials and methods of construction in Parts 2, 3 and 5. New Materials Surface focuses on surface materials and methods of construction found in Parts 2, 3, 4, and 6. Special Provisions Guide focuses on provisions in the Greenbook which require specificity, choice, or additional information to be contained in the contract-specific special provisions as well as the format and structure of the special provisions.